FK Lowry Piling have recently completed a precast piled windfarm at Goole Fields in East Yorkshire. This was a logistically challenging project with delivery of piles key to its success. With 16no individual turbines to construct, some 1km apart, piles could only be delivered when piling equipment was present at each base for offloading purposes. Timing of installation and inter-site moves was therefore critical to mitigate idle plant. More so, as piles were cast and loaded in the manufacturing yard in Lisburn and shipped to the East coast 2 days prior to driving. The 16no bases comprised of some 645no 270mm2 Precast Piles varying in depth from 12-22m. 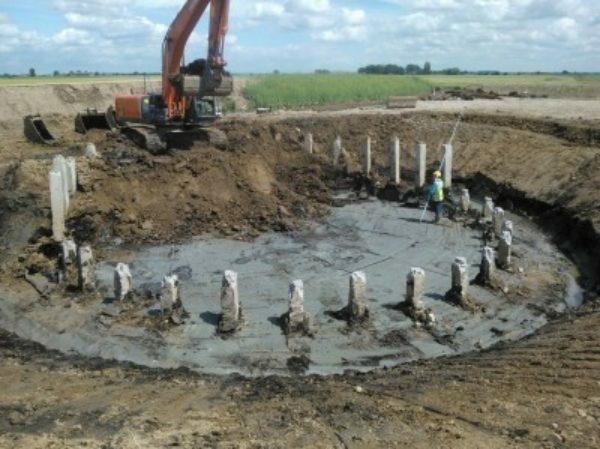 Non-standard stock piles were cast using DC3 concrete, increased reinforcement and special joints to cater for tension capacity requirements. Contract manufacture, design and installation was verified by an intensive testing regime including 2no preliminary pile tests in compression and tension, 4no working static tests and 10% of piles dynamically tested with Capwap analysis. The project was completed utilising 1no Junttan PM20 driven rig with a 5T accelerated hammer within the 14 week tender programme.